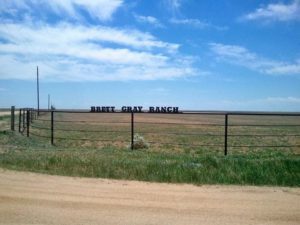 The Brett Gray Ranch is a 50,000-acre ranch currently leased and managed by Round River from the Colorado State Land Board. In partnership with the State Land Board and The Nature Conservancy, Round River has a three-part goal to maintain a productive and sustainable ranching operation, encourage science and stewardship that maintains biodiversity and a sustainable prairie ecosystem, and to support education and community outreach to appreciate and support effective conservation of prairie ecosystems through responsible ranching. During the past seven years of operations at the Brett Gray Ranch, Round River has demonstrated its commitment to these principles by implementing a planned rotational grazing system that is designed to limit the duration of the grazing process and provide adequate recovery for the grazed plants. This grazing system helps to improve the four ecosystem processes by adding more organic matter to the soil, building a stronger root system, providing better water capture and infiltration, stronger more vigorous plants that capture more energy from the sun, increases the biodiversity of the plant and animal community and helps to protect sensitive riparian areas from degradation and erosion. These improvements have been achieved during some of the most severe drought conditions on record and have been documented through an intensive monitoring process conducted by Round River, the State Land Board and The Nature Conservancy.